The most memorable performance at MTV's Video Music Awards wasn't Lady Gaga or even Lady B. Nope, as Daniel Kreeps from Rolling Stone notes, the most memorable — and disturbing — performance at the VMAs was carried out by rapper/producer Kanye West. And the brother wasn't even trying. Now, we know Yeezy likes to speak his mind. His post-Katrina comments about President Bush not caring about black people during a live broadcast for hurricane relief already showed fans and haters, alike, just how much the man is willing to bite is tongue. 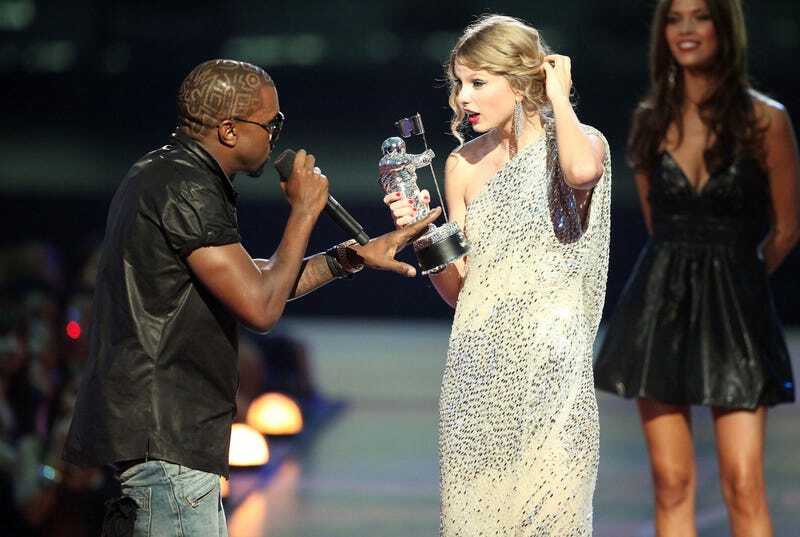 But when the "Best Female Video" came into question, Kanye was, again, quick to let the crowd (and millions of viewers) know how he was feeling. He stormed onto the stage and stole the mic from singer Taylor Swift, mid-speech, as she accepted the win for her "You Belong to Me" video. A jaw-dropped audience watched as Kanye announced, "Beyonce had the best video of all time!" Taylor Swift was at a loss for words. Beyonce looked mortified. And the stunned crowd started booing as Kanye shrugged his shoulders and walked off stage. Watch for yourself. Quickly after being booted out of the VMAs, Kanye posted a message to his fans attempting to explain his actions: "i’m not crazy yall, i’m just real. Sorry for that! I really feel bad for taylor and i’m sincerely sorry!" Being real — and loud — can have consequences, 'Ye. Just ask Vernon Franklin. Saaret Yoseph is a writer and Assistant Editor at TheRoot.com. She manages and blogs for \"Their Eyes Were Watching …\"